Government of Pakistan, Ministry of Interior has announced 63 New Jobs in National Administration & Data Base Registration Authority 2018. 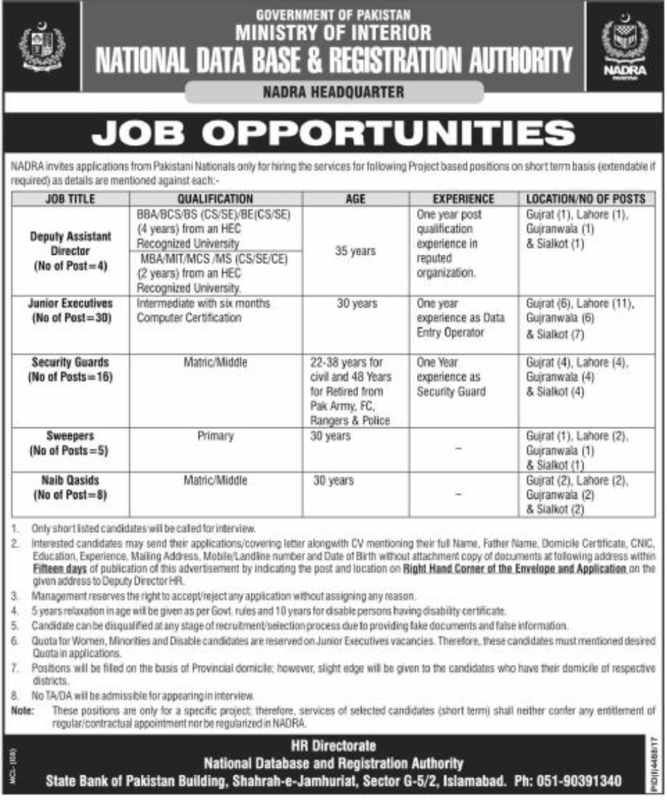 Candidates who meet the required Criteria may apply for these NADRA Jobs 2018. These jobs are on Project base (Short Term) and successful Candidates will have no right to be Permanent/Regular. Appointment will be on Provincial base however local Candidates will be given Preference. Applicants can apply for Deputy Assistant Director 04 Posts, Junior Executives 30 Posts, Security Guards 16 Posts, Sweepers 05 Posts and Naib Qasids 08 Posts.